SWOT Analysis: the initials stand for Strengths, Weaknesses, Opportunities and Threats and provides a simple, but effective means of considering potential decisions before you implement them. 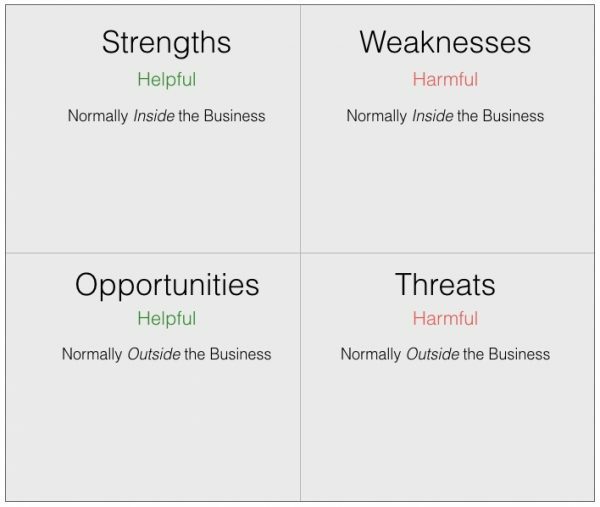 SWOT Analysis is a tool you can do on computer, or on the back of a napkin. All you need is a two-by-two grid. It is as simple as what you see below. You can do it on your own or in a group. The results are often stronger when your work in a team. You can usefully use outsiders as well. In any kind of planning process the SWOT analysis is a useful tool. You may see it in a business plan, a marketing plan, or a project plan. It is even better if you use brainstorming to generate what you put in each box. If you use the benefits of team creativity you can do it either as a group in one place or use one of the many collaborative tools on the Web. actions to mitigate each threat. If you need to pull apart the factors and examine them in greater depth, then you can use the Fishbone or Cause and Effect diagram. Possible Strengths might be: patents; price/cost advantages; exclusivity; speed of new product development; known brand acquired. Possible Opportunities might be: unrecognized space for innovation; additional markets; demographic change; new distributor. Possible Weaknesses might be: shortage of cash for stock; unreliable supplies of raw material; inexperienced staff; low brand recognition; high cost structure; low margins; narrow range. This tool is deceptively simple, but often very revealing and can be used to lead on to describe your Critical Success Factors (CSFs). Defining your CSFs will increase the focus of your work and you will be able to draw on them when you define your goals. Critical Success Factors are the ones that will make the difference between success and failure. If you want a little computer tool to help you, try one from Smart Draw.